This photo shows the assembled burner and pilot. This assembly step was to check that all the holes were drilled in the proper places, the sheet metal fit the casting properly, and that everything mated together properly and would be serviceable. The vaporizer tube is projected out of the burner shell for connection of the fuel line. The new stainless steel clamping hardware that was custom machined to replace the cracked castings can be seen above the pilot. Missing in the photo is the L-shaped burner nozzle. 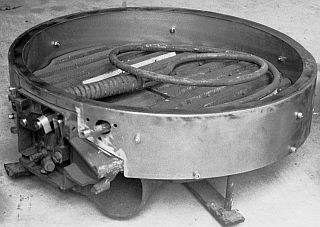 As a Cruban burner is all cast metal and not the combination tin and cast metal that the Stanley construction provided, they are quite heavy to move about. The Stanley burner also presents a relatively flat bottom making them more stable to sit on a flat surface. A Cruban burner has the pilot air intake and a highly curved bottom making them more difficult to sit on a flat surface. A special fixture came with the car for the purpose of handling the burner. Basically a set of heavy pieces of bar stock crossed in an “X” with short steel rods on the end, the fixture allows the burner to be sturdily supported and not be damaged. One of the fixture legs can be seen at the five o’clock position in the photograph.